THE DECISION by a major engineering union to call for new nuclear generators in Britain will give much needed impetus to the presently hollow debate on energy. The assertion by Amicus last month that we are as little as five years away from an energy crisis may have ruffled a few feathers, but it remains virtually unchallenged within the industry. The question is, what can be done? At present, nuclear generation provides about a quarter of our electricity. It is a significant element in the fuel mix along with coal, gas, oil and to a much lesser extent renewables (wave, wind, solar, hydro etc. ), yet in the face of accelerating consumption, up by 19% between 1990 and 2001, the nuclear contribution is set to decline to 16%. Within five years, a third of our nuclear power stations will reach the end of their working lives and close. Over the next 10 years, 10 nuclear power stations will close, with only two set to replace them. The viability of Britain as a modern industrial economy is inextricably linked to a reliable, cost effective source of energy. Recent events, e.g. the stand-off between Russia and Ukraine which jeopardised the supply of gas to Europe, have hammered home the danger of dependence on an external source. 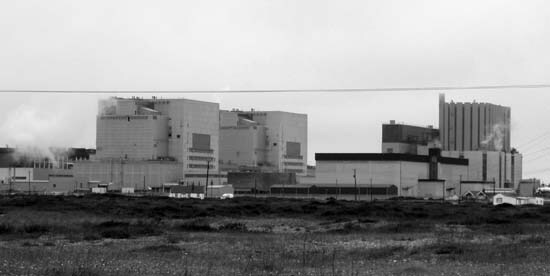 Dungeness, Kent: home to two nuclear power stations, one (Magnox) due to be decommissioned in 2008. But the truth is that for decades successive British governments have abandoned our capacity to be self reliant in terms of energy. From the selling off of North Sea oil to the highest bidder, through the complete elimination of the domestic coal industry, to the "dash for gas", the pattern has been the same: the relinquishing of the strategic control of the power needed to drive industry. The latest irresponsible act has been tthe government's agreement to the sale by BNF of its subsidiary Westinghouse Electric to Japan's Toshiba. Almost half the reactors operating in the world today run on Westinghouse technology. As countries throughout the world start looking at nuclear again, there will be a queue for those wanting to build new stations – and Britain will be at the back. The Energy White Paper, published in November last year, maintains the theme. "...We do not propose to set targets for the share of total energy or electricity supply to be met from different fuels. We do not believe Government is equipped to decide the composition of the fuel mix. We prefer a market framework, reinforced by long term policy measures, which will give investors, business and consumers the right incentives to find the balance that will most effectively meet our overall goals". Such craven devotion to the wisdom of the market would be laughable if it were not so foolhardy. For we are indeed uncomfortably close to an energy gap where supply cannot meet demand. It is estimated that if things stay as they are, British power stations will be unable to supply 20% of our peak demand for electricity in 10 years' time. So there is a debate to be had. And at the heart of it is the often vilified 'N' word. Proponents of nuclear energy stress the long-term dependability of supply and a safety record that bears comparison with any other energy industry. Here's the British Nuclear Energy Society. "...It is not long ago that the UK was amongst the world leaders in nuclear energy, through its birth, development and consolidation. We invested considerable resources in the form of cash and very capable and committed people. Nuclear power is now mature, with some 450 commercially operating nuclear reactors worldwide, performing at very high levels of safety and reliability. The UK has a great opportunity to reduce our dependence on future fuel supplies from politically volatile countries, but it must be grasped now. By learning from our own past experience and from current world best practices, we have a unique opportunity to plan for the replacement of the existing nuclear stations with top quality new designs." For some, however, nuclear power and nuclear weapons are two sides of the same coin. And for others, it is waste disposal and contamination which pose the greatest threat. These are genuine concerns and cannot be ducked. As is so often the case, we need to go back to science to find solutions to these dilemmas. Scientists have long known that nuclear fusion has the potential to generate vast quantities of energy without the dangerous by-products of nuclear fission. One kilogram of fusion fuel would produce the same amount of energy as 10 million kilograms of fossil fuel. The biggest practical difficulty is in generating and controlling the intense heat necessary, some 100 million Celsius, many times hotter than the centre of the sun. The technical obstacles are immense, but a joint scientific project has been under way since June of last year, aiming to find a solution to these difficulties. The International Thermonuclear Reactor (ITER) presently under construction in France is the most expensive joint scientific project after the International Space Station, and involves collaboration between European countries, the US, Russia, Japan, South Korea and China. The project has an estimated cost of 10 billion euros and is expected to run for 35 years, based on the site of an existing nuclear research centre near Marseilles. It is intended to produce the first sustained fusion reactions and would pave the way for a prototype commercial power station. Clearly, with a lead-in time of 35 years, scientists are not underestimating the enormity of the task. There will be no overnight solution. But there is an understanding that pooling of expertise and knowledge, together with genuine co-operation, is the way forward for such groundbreaking projects. Plutonium-239 and highly enriched uranium-235 are the isotopes essential to the production of atomic bombs. They come from reactors fuelled with uranium-238 whose only job is to produce the weapons grade isotopes. A reactor intended for energy production would not use this process. It produces a mixture of plutonium and uranium isotopes, but it is essentially impossible to separate out the weapons grade isotopes in sufficient purity for bomb making. (Britain, America, Russia and France have all tried but failed to do this, despite the best scientists and all the money in the world to throw at it). Weapons reactors do not produce electricity, and reactors which produce electricity cannot make bombs. The technologies are distinct and independent. We have the knowledge to make weapons and the knowledge to produce electricity. We can do one, or the other, or both. Simply turning our backs on nuclear production of energy will of itself have no impact on weapons production. There is a case for an internationally agreed and independent verification procedure that could distinguish energy production from bomb making. But the stress here must be on "independent". The atomic experts sent into Iraq discovered that the plants they were investigating were not for bomb production, and were summarily withdrawn by the US because this was not what it wanted to hear. Similarly, the nuclear non-proliferation treaty does not prevent states from acquiring these weapons; it merely restricts membership to the club of suppliers that sell on the open market. It is also used to dissuade developing countries from becoming self-reliant. Note how it is used to foment war on Iran by making the non-scientific claim that energy-producing power stations will be used to make bombs. Iran asserts its sovereign right, quite correctly, to develop and progress its nuclear industry to meet its own needs. The present threat of a nuclear explosion in Iran comes from Bush and Blair. Some warn of a terrorist attack directly on a nuclear power station causing a catastrophic nuclear explosion. But again, the physics tells us that, unlike the confined space of a bomb, a reactor core is too large a space for neutrons to collide with fissionable material at a sufficient rate to trigger an atomic blast. It would fizzle rather than explode. Meltdown and contamination are another issue of great concern, with Three Mile Island and Chernobyl put forward as cautions. And so they should. But again, the point is, what can we learn? In 1979, at Three Mile Island in Pennsylvania, a cooling system malfunction led to the meltdown of the reactor, and though the reactor vessel was not breached, some radioactive gas was vented into the atmosphere. More modern, carefully designed systems have substantially reduced this risk. In 1986, at Chernobyl in the Ukraine, a reactor meltdown was accompanied by massive explosions. Some 30 people were killed on the site, and the resultant radioactive cloud affected large areas of Northern Europe. The number of deaths (largely cancers) attributed to the fallout from Chernobyl is calculated now at between 8,000 and 16,000. A tragic loss of life certainly, but not unavoidable. Faulty reactor design, inadequately trained personnel and an abysmal safety set-up were the decisive factors at Chernobyl and do not have to be repeated. Perhaps the most difficult problem of all is the disposal of waste, which is highly radioactive, and must be kept away from people. The most radioactive isotopes decay the fastest, so that after 10 years the waste is 1,000 times less radioactive. After 50 years, the waste is less radioactive than the aluminium ore from which it was extracted in the first place. Dangerous undoubtedly, and a long-term challenge, but not insurmountable. Burying deep underground encased in blocks of glass is one proposal, but much more work needs to be done. And new designs of reactor produce less waste, with more efficient reprocessing. What cannot be tolerated is the notion that if something is potentially dangerous we must stay away from it. Driving a car at 70 mph is risky but can be done safely, though once unthinkable. The development of renewable energy extraction (wind turbines, solar panels, wave power and so on) has developed dramatically in recent years, but even its most fervent devotees will concede that it makes only a minute contribution to overall supply. A feudal economy might struggle by on renewable energy production, but not an industrial one. The material case for developing nuclear technology as the cornerstone of a sustainable energy policy is compelling. Exploitable reserves will supply us for many thousands of years. (The fission of one atom of uranium produces 10 million times the energy produced by the combustion of one atom of carbon). Fossil fuel supplies are much more finite, and will become increasingly expensive as extraction becomes more difficult. Theoretical work on nuclear fusion (the combination of atoms to produce energy much as the sun does) is promising but needs further development. (See box left). What is fundamental in all of this is the notion that progress is sustainable. In the event, now likely, of an 'energy gap', there are two basic responses to the outstripping of supply by demand. One is to increase supply, in which case nuclear development is pivotal. The other is to reduce demand, and here we're not talking about turning off a light bulb. Do away with industry, with transport, with everything that makes modern life possible. This is a recipe for stagnation, and will, ironically, be a source of far greater misery for the people of the world.